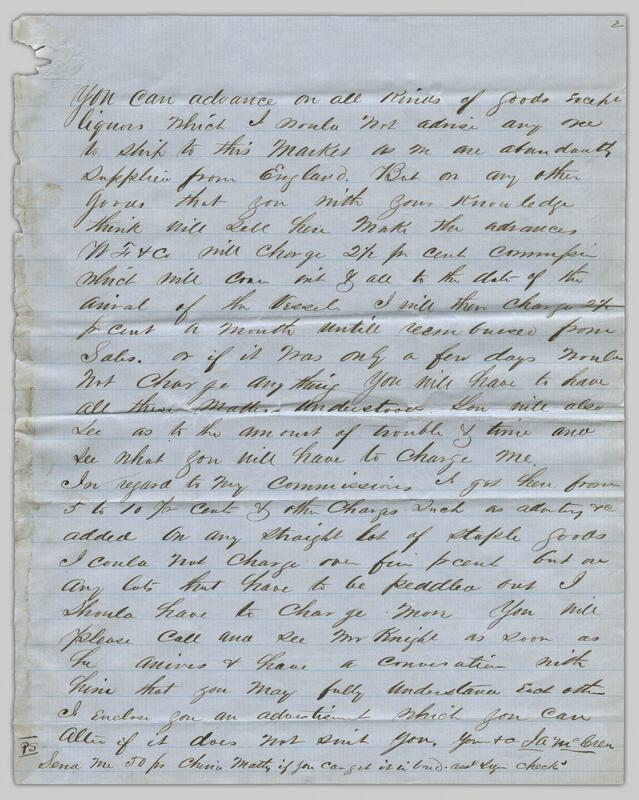 The Royal Fisk Gold Rush Letters are collection of over 900 original manuscript letters from the Cariboo Gold Rush period, 1862-1868. 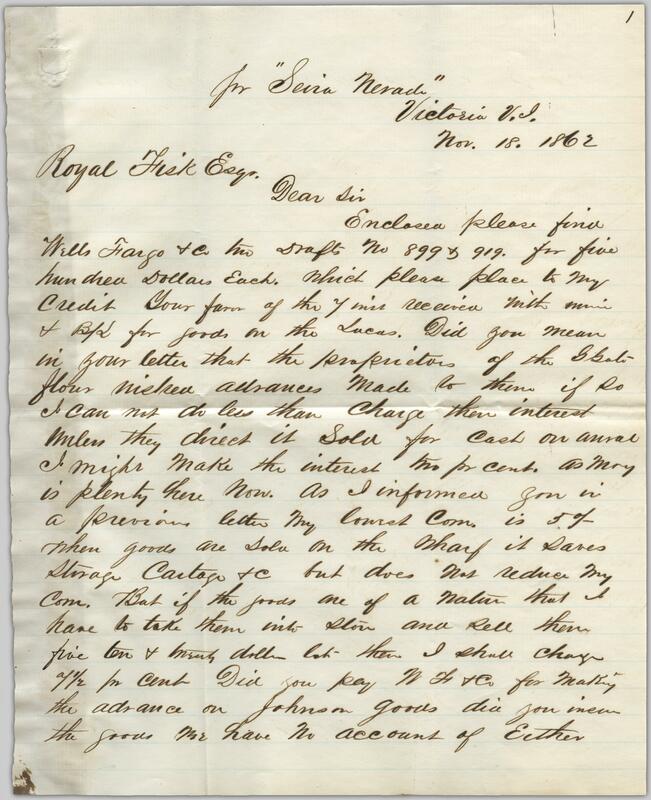 Merchants in the Victoria area wrote the letters to Royal Fisk, a shipping agent in San Francisco, during the height and decline of the Cariboo Gold Rush. Take a look at these letters! Most are written in cursive, and many with handwriting that is practically unintelligible today. For example the letter here is Fisk_ 02_014_002 – meaning we are on the second page on the 02_014 letter. Then the transcript of the letter makes its way to us at DI, where one of our coop students, Carolina, double checks the transcript of the letter matches the real thing. 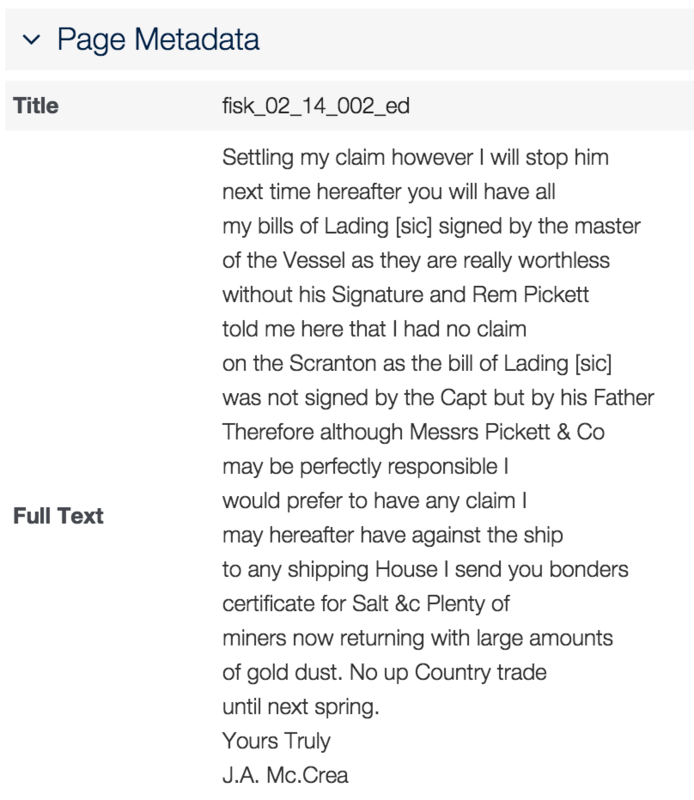 The transcript is put into the “Full Text” field; complete with manual line breaks input by the long-suffering Carolina. These line brakes help readers navigate the (mostly) cursive lettering. A block of text would be difficult to match to the original letter! Check out the two transcribed the letters of J. A. McCrea to Royal Fisk by clicking the images. Both of the letters in this post were written James Alexander McCrea an upright auctioneer and merchant from Victoria. Surprisingly he was involved in not one but two murder scandals! McCrea’s signature and date May 32, 1862 – He’d live another 26 years. McCrea moved to Victoria from the southern US states in the 1850’s. You can see our letters are dated in the 1860’s. In Victoria he auctioned off materials damaged in shipping such as rope or coffee. Respected in the community he was part of the fire department and a teetotaler. In 1869, after his wife’s death, he sold out his business and moved back south to the states. That is where the trouble started. In 1870 it was reported in Victoria that McCrea had been killed in Arizona or New Mexico by an Apache tribe. The rumor was revealed later to be false in the papers– there was still hope! – at least until 1881. That was when he was shot in Deming, New Mexico. He made the mistake of asking a cowboy in a saloon “Does it pop?” about his gun. How’s that for a wild west story? Green, Valerie. (2000). Upstarts and outcasts: Victoria’s not-so-proper past. Victoria, B.C: TouchWood Editions. See if you can find anyone else in our Royal Fisk Gold Rush Letters collection who appears in this book – then let us know. Thanks to Carolina for her help on this article!